This post is sponsored by Carlson™ Pet Products. We only share information we feel is relevant to our readers. Carlson™ Pet Products is not responsible for the content of this article. Yep, I’m talking about the day I rescued Linus from the Carson Animal Shelter. I already knew I wanted to crate train Linus, but I had yet to research the different types and styles of crates. I’ve been raising puppies for Guide Dogs of America (GDA) and other service dog organizations for 12 years! Holy cow! One of the great things about raising for an organization like GDA is they help you get started with your new puppy in training. They give you a puppy starter kit, puppy raiser manual, and you also have the option of borrowing one of their crates. Over the years I’ve had the chance to borrow different sizes, types, and styles of crates. On top of that I’ve purchased my own crates and I’ve also received crates from our sponsor Carlson Pet Products for review. What Is The Proper Size Crate For A Puppy? 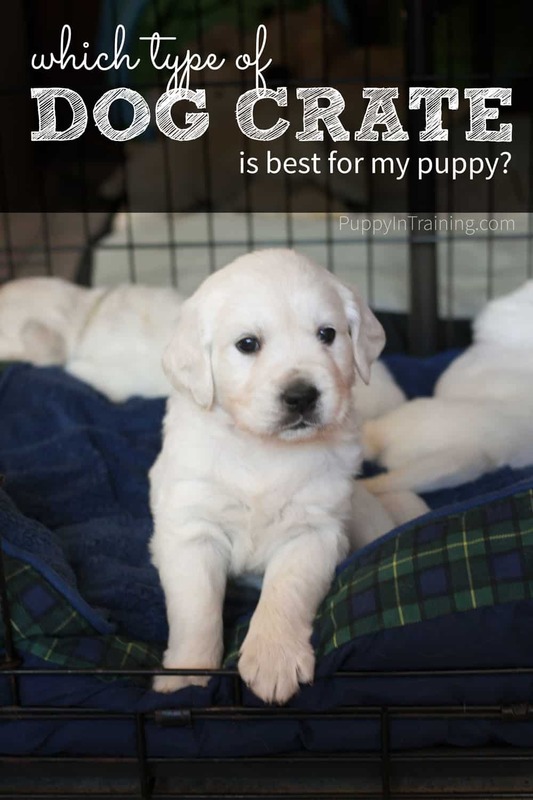 If you plan on crate training your puppy then it’s uber important that you choose the proper size crate for your pup or get a crate that can adjust to the size of you puppy. What is the proper size crate for a puppy? A crate should not be too big, but large enough for your puppy to stand, stretch and turn around. Get the proper size crate for your puppy and purchase a larger crate when you puppy outgrows the small one. Get a large crate with a divider so you can increase the size of the crate as your puppy grows. We like our Carlson Double Door Crate w/ Divider. When we brought home Linus we purchased a large wire crate with a divider. However, when we raised puppies for GDA we borrowed a small plastic molded crate which was much easier for transporting our small puppy from the campus to our home. As our pup outgrew the small crate we moved him to an intermediate and later a large crate (also borrowed from Guide Dogs of America). I’ve used and owned both wire and plastic crates. Which crate do I prefer for my puppies? Easily Stored: If you have multiple crates like me or if you decide you don’t want to use the crate anymore you might need to store your crate. Wire crates are collapsible and easier to store. The plastic crates I’ve owned can be made into two half shells and stored, but they still take up more space then the wire crates. Visibility: Every puppy is different. Some like to see out of the crate while others like it more dark and den-like. We like the wire crate because you can either have it open so your pup can see everything going on around him or we throw a blanket over the top so he can’t see out which can be good for quiet time. Unfortunately, you don’t have this options with a plastic molded crate since it’s mostly all closed up with limited visibility for your puppy. Divider: Most (but not all) wire crates we’ve come across also have a metal divider allowing you to adjust the size of the crate to fit your puppy as he grows. We’ve yet to see a plastic molded-crate with a divider. Plastic Tray: Our wire crates came with a plastic tray that is easy to slide in and out. If your puppy has a potty accident in his crate it’s easy to slide the tray out and clean up. We’ve rarely had puppy pee or poop accidents in the crate, but we have had vomit and diarrhea that was easy to cleanup by sliding out our plastic tray. One thing…When we put a blanket over the top of the crate we’ve had some of our puppies decide it was their new toy and chew and shred the blanket. One more thing…The plastic tray is not as durable as the rest of the crate. Ours have cracked and required replacement over the years. The plastic crates are enclosed and wouldn’t require a blanket over the top and therefore no shredded blankets unless your pup decided to shred the nice plush blanket you put in his crate to keep him cozy. Yes, that has happened too. Stetson and Raven testing plastic, wire, and travel dog crates. I’m not an expert with the travel crates, but I have tried two in recent years. On a whim we bought a pop up travel crate at Target that we thought we’d use at the beach. My advice on this and similar pop up crates? I do not recommend pop up crates like the one pictured below. Because this particular pop up crate was so light, when my puppy, Derby laid up against the side wall, it collapsed. After he figured out he could move the crate he tried to use it like a hamster ball. Pop up crates might work well for smaller dogs, but in my experience with my Lab puppy…no es bueno (those 4 years of Spanish are really starting to pay off). Derby in his pop up dog crate circa 2008. See the travel crate Raven is sitting in the image 2 pics up? I used that crate with Stetson in our hotel room at BlogPaws 2016. It worked perfect as a getaway for Stetson in our hotel room in between learning sessions. It was much sturdier then the popup crate, but lighter and more portable then our regular wire crate. Of course we’re talking about puppies. My biggest concern with using a mesh travel crate like the two mentioned above is I can envision a puppy getting bored and chewing through the mesh. I would definitely not leave my puppy (or even and older dog) unsupervised in either of these travel crates. Fashionable Dog Crate Or Furniture? Disclaimer: I’ve never used a fashionable dog crate/furniture, but I wanted to include this category to have a complete list of crates available to you, the reader. The crate I listed is highly rated on Amazon.com. However, please always perform your own due diligence. We have yet to buy a dog crate that is also a piece of furniture unless using our wire crates as night stand counts? Ugliest night stands ever! I can’t say whether or not the below crate is a great product. However, I did want to list the option here so you could see there are some more stylish crates on the market. If interior design is on the top of your list then you might want to try one of these crates. My biggest problem with crates that look like pieces of furniture? They can be a bit pricey! Disclaimer: We have not had the need for a heavy duty crate and therefore we have not tested this category of crates. Once again I wanted to include these options so you, the reader would have a complete list of options. The crate I listed is highly rated on Amazon.com. However, please always perform your own due diligence. Fortunately, we have not had the need for one of these heavy duty dog crates. However, we have heard of some puppies that are capable of destroying the plastic molded and/or wire dog crates. That thing is a BEAST! And, speaking of pricey…YIKES! What Dog Crate Are We Using With Our Puppies? Charlie practicing his crate training in his Carlson wire dog crate. 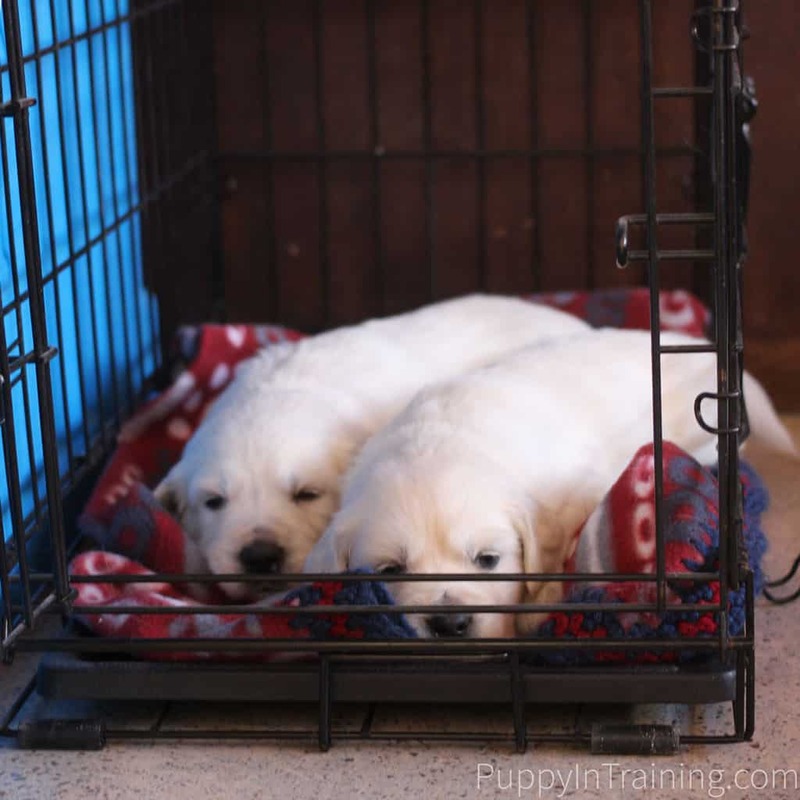 We are currently using two different Carlson Dog Crates with our puppies and dogs. The Carlson Single Door Dog Crate – this crate is a bit less expensive, but does not include the divider and has…you guessed it a single door. 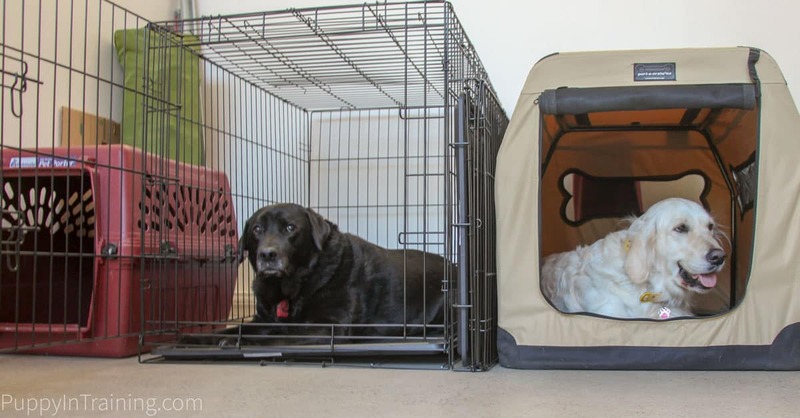 The Carlson Double Door Dog Crate w/ Divider – if I were purchasing only one dog crate then this is the one I’d buy for my puppy. We still have, but do not really use the plastic molded crates. Our travel crate is somewhere in the garage collecting dust (I pulled it out for today’s photo shoot) and I think the popup crate met it’s demise during our move back in 2014. If I was planning on only purchasing one crate for my puppy then I’d far and away choose a metal wire dog crate like the Carlson Double Door Dog Crate w/ Divider. Versatile – You can use it with your puppy all the way to adulthood. You can use it at home or for traveling. You can leave it open so your puppy can see the world or cover it up with a blanket for privacy and quiet time. Durable – We’ve been using several of our wire crates for well over 10 years. One Exception: the plastic tray cracks and will require replacement. Easy to use – It doesn’t require a brain surgeon to setup or collapse the crates. Easy clean up – It’s easy to slide the plastic tray in and out if your puppy makes a mess. Inexpensive – Great value for a crate we’ve used for years with many of our service dog puppies. Did you or are you crate training a puppy? If so, what kind of crate(s) did/do you use? Which type of dog crate is best for my puppy? I’m planning to buy this one, add to wishlist.